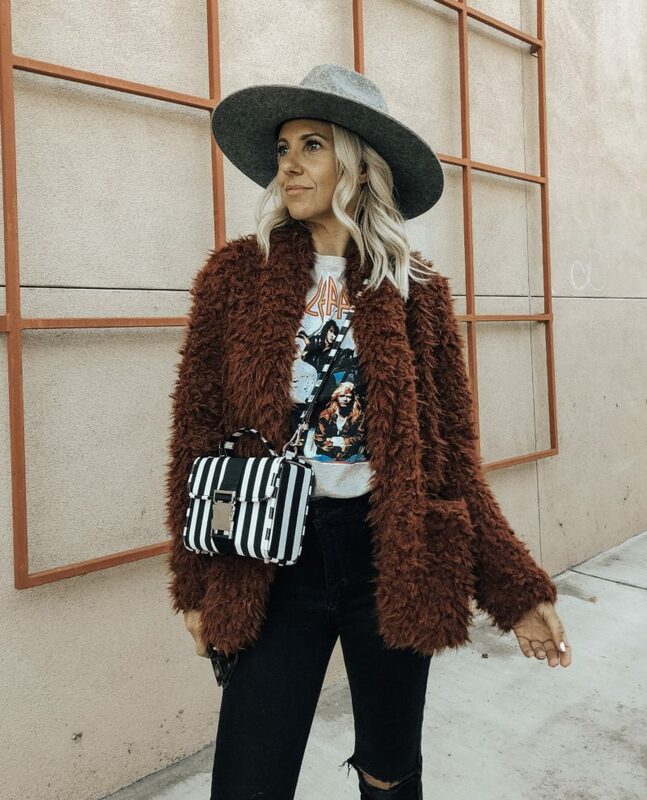 I’m loving all the Fall trends right now and this outfit has quite a few that I want to share with you. Starting off my entire outfit is in the jewel tones color scheme and I love it. I got these amazing jewel toned statement earrings from the Rebecca Minkoff X Stella & Dot collaboration and I’ve been on the hunt for clothes to pair with them. Then I found this amazing velvet bodysuit from Zara and the rest of the look just sort of came together from there. Velvet is another hot trend right now and although I love it I was having a difficult time finding just the right piece. The pearl style button details (another big trend) are so cute and the bell sleeve is perfection. Since it’s a body suit I paired it with a high waisted jean from A&F and this crop flare style allows me to show off my jewel toned embellished shoes. I then added this fun belt bag to the look- which of course is another big trend right now. I know what you’re thinking and NO this is not a fanny pack. I grew up in the 80’s and I’m very familiar with the fanny pack- of course I’ve owned quite a few. Although a belt bag has the same functionality of a fanny pack it is much more chic. What I love about a belt bag is you can carry your essentials -cash, credit cards, id, iphone and have your hands free. I love it for theme parks or busy places where I bring a stroller and leave all the kids stuff there so I don’t have to worry about my wallet getting stolen. Below I’ve rounded up a few of my favorite velvet tops and belt bags for you to check out. And the answer is YES you can pull off a belt bag!